Crafted from Alder hardwood solid, the Mix-N-Match Dining Side Chair is a classic piece for your dining room. Finished in a beautiful, heavily distressed Dover White, this chair has an aged look that lends visual depth, dimension, and character with its presence. 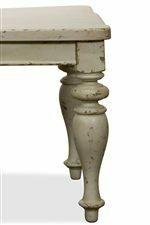 Traditional turnings decorate the front legs, and stretchers provide support and additional detail. A vertical slatted back offers comfort and repose, and an arched top lends a sense of shape and movement to the piece's design. Features a wood seat. Complete the dining space in your home with this dining side chair, or pair with other chairs in the Mix-N-Match collection to uplift your home. The Mix-N-Match Chairs Dining Side Chair with Wooden Seat by Riverside Furniture at AHFA in the area. Product availability may vary. Contact us for the most current availability on this product.